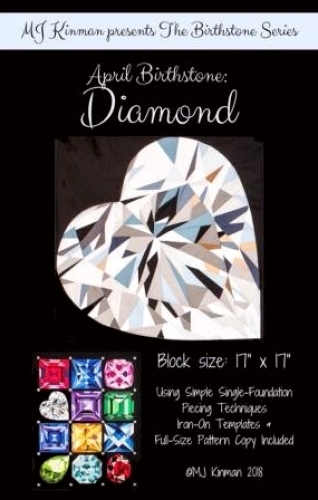 Freezer paper piecing Block pattern for 17" square block representing the April birthstone Diamond. Includes a fully-coded freezer paper template; full-scale paper copy to use as a key; and 12-page pattern booklet that includes fabric requirements, detailed instructions for block construction, and instructions and fabric requirements for optional projects (i.e., 18 in square pillow, 4-block wall-hanging, 12-block full-size quilt as shown on pattern cover), and quilting suggestions. Single-foundation piecing is not typical paper piecing: templates are ironed to the RIGHT side, so there is no confusing reverse piecing; templates are easily removed and REUSABLE, so there are no paper bits to pull from the back of the quilt; reduces fabric waste since there is no flip-and-sew method used. Makes wonderful Block of the Month project, Mother's Day quilt (featuring the family's birthstones), baby quilt (featuring Baby's birthstone). Note: The Diamond Block also makes a lovely wedding signature quilt that can be used as a "guest book" at wedding receptions. The "fire facets" could be replaced with the couple's wedding colors.